Mix 4 cups of water, Chili sauce, Soya sauce, vinegar, sugar, salt, pepper powder and ajinomoto and bring to boil. Now add all the chopped vegetables except paneer . Cook for a minute on a medium heat. Dissolve corn starch in 1/2 cup water and add to the soup stirring constantly till it becomes thick. Cook for a minute, add paneer slices. 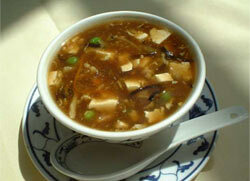 Hot and sour soup should be prepared just before consuming and should be served fresh, else it will lose the taste.